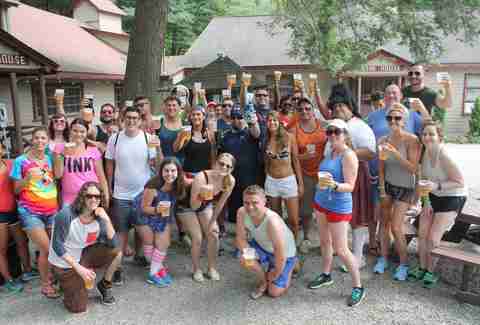 Want to join us at our inaugural Camp Thrillist weekend? Grab your tickets here for a weekend of kickball, slip & slides, comedy shows, beachside BBQ, plenty of booze, and more. In case you were never sent off to camp for long summer days of hiking, swimming, and mosquito bites as a kid, don't worry -- it's not too late to experience all the best parts of a summer camp getaway now that you're an adult. In fact, Thrillist is teaming up with a summer camp just for adults this August to do summer camp the right way: with tons of great food and booze. 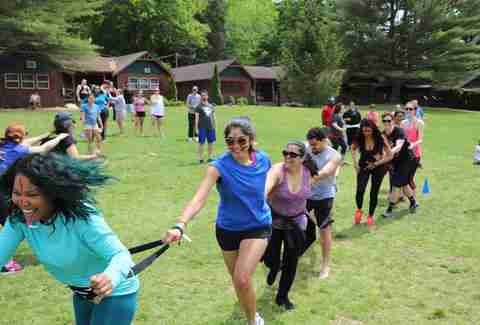 Club Getaway, a sprawling lakeside summer camp in Connecticut, is transforming into Camp Thrillist for a weekend retreat in the great outdoors this August 17 through August 19. The rustic resort is just a short drive from NYC and Boston, making it a convenient way to ditch all of your usual responsibilities. At least, until Monday. 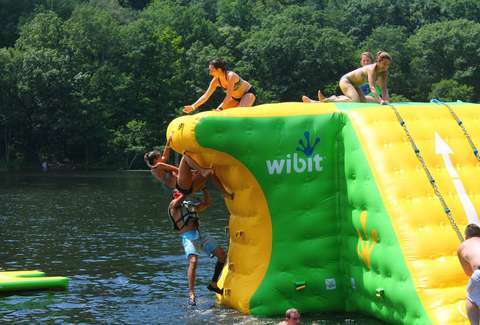 For three days and two nights, you and your friends can escape the city and trade "adulting" for summer camp activities like zip lining, boating, archery, slip & slide kickball, and more. When you're not too busy kayaking or hiking, you can relax in the sun with delicious food right off the grill and all the cold beer you can ask for. And because we're talking about Camp Thrillist, you can go all out with a high-end s'mores and ice cream sundae station. Tickets for Camp Thrillist are available now. Just 90 minutes outside of NYC, Club Getaway overlooks a lake on 300 wide-open acres in Kent, Connecticut. Think the sleepaway camp your parents may or may not have sent you to as a kid, but built exclusively for adults looking to get away for the weekend. It's just removed enough to be a quick escape from your usual responsibilities and it's packed with enough outdoor activities, eating, and drinking to make you completely forget about work. And with Thrillist taking over the camp for the weekend, the dining options and activities will be particularly legit. Along with all the summer camp activities -- hiking, boating, archery, dance parties, and more -- at the idyllic retreat, "Camp Thrillist" will feature professional chef-led grilling courses, mixology classes, themed dinners, and damn-good s'mores around the campfire, of course. And in true Thrillist style, there are also a few surprises in store. Getting there by car is easy, especially from NYC. Take the Hutchinson River Pkwy N and I-684 N to NY-22 N. If you're coming from Boston, the camp is a three-hour drive via I-90 W and I-84. From New Jersey and Philly, take I-95 or the Garden State Parkway. Or, if you don't feel like driving, you can score a seat on the Getaway Bus for another $65. The bus departs NYC on Friday, August 17 at 5:40pm and returns on Sunday, August 19 around 6:30pm. You'll be staying in the great outdoors, yes, but you certainly won't be "roughing it." Your ticket includes a two-night stay in rustic, but also elegant, cabins complete with air conditioning, private bathrooms, and housekeeping -- much like a hotel room. You won't find any sweaty, mosquito-filled tents. Instead, you can retire to a memory foam mattress and fresh linens when you're all danced out and done partying for the night. If you're staying with friends, you can fill a 2-, 3-, or 4-bed cabin. Or if you're camping solo, the camp will match you with people of the same gender and similar age. Get your summer camp mess hall memories out of your head, and get ready for top-notch meals. You may end up eating your way around the world -- grilled dish after grilled dish -- at an Epcot-style international themed dinner. You'll get to experience cooking a whole animal over an open flame, up close. You will probably be drinking the entire time. Again, we're not messing around when it comes to eating and drinking all weekend. Perhaps best of all, there will be a high-end s'mores station, featuring all the ingredients and recipe tips you need to build the most insane and delicious s'mores. Send tips to news@thrillist.com and follow us on Twitter @Thrillist.